"Gadsden-Williams is an award-winning global diversity expert who launched Ceiling Breakers LLC to help women and professionals of color to reach their potential. In her book, she talks about her journey as a woman of color who's had top senior-level positions in corporate America while managing a chronic illness. She also provides solutions to address the challenges women face navigating the business world, essentially a playbook for dealing with some of the most demanding workplace issues." "The first book from diversity expert, philanthropist, and Accenture lead executive Gadsden-Williams incorporates both memoir and career guide...Hers is a realistic, pragmatic discussion of what it takes to make it in Fortune 500 companies, and in life." "In this memoir and guidebook, Gadsden-Williams interweaves the story of her life as a black female executive with research statistics and savvy career tips for minority women also seeking to occupy the 'C-Suite'...Always candid about the realities of corporate life, the author offers sound advice for minority women seeking advancement, recognition, and meaningful lives. Illuminating and useful." "Michelle Gadsden-Williams has accomplished something rare for a black woman in America: maintained a successful corporate career at the highest level. Climb is the story of her journey to the top, and her generous effort to send the elevator back down for the rest of us." "Gadsden-Williams has written a brilliant book that reveals how companies can leverage diversity as a competitive advantage in today's marketplace. With vivid stories from her twenty-five years of experience], Climb is a book that will reframe HR into a powerful strategy function for twenty-first century organizations." "Gadsden-Williams has used her personal story of resiliency to provide invaluable insight into how to build a fulfilling life, not just a career. She pulls no punches when sharing her experiences as an African American woman determined to fulfill her dream to help others live up to their potential." "Most organizations were not designed for women of color. In Climb] Gadsden-Williams takes us on a journey of her career--the winding road of making tough career and family decisions, seeking out and shaping opportunities, and walking away when others thought she should stay. There is raw, sincere vulnerability displayed in this book... and there] is also a call to action--intentionally shape your career and be an active partner in shaping the organizations you are a part of. Thank you for sharing your story I am sure it will be an inspiration to its readers. 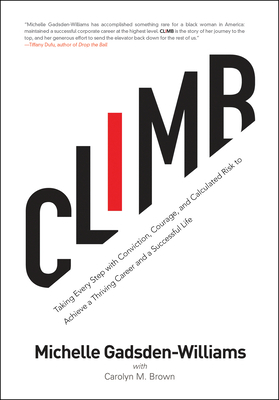 Keep climbing "
"A frank memoir plus career guide, Michelle Gadsden-Williams shares personal stories of self-assurance, resilience, and bravery that serve as lessons for women in the workplace. This book is essential reading." Renowned as a diversity and inclusion strategist, Gadsden-Williams held C-Suite positions at major organizations for many years...and then took the off-ramp to probe a different career path, launching Ceiling Breakers LLC, with the primary goal to help women and professionals of color reach their full potential. As a woman of color and corporate executive who has worked and traveled the world for several Fortune 500 companies--all while managing a chronic illness--she provides insight into overcoming the barriers facing professionals in today's workplace. In Climb, Gadsden-Williams combines her inspirational life story with pragmatic solutions to address problems facing women in corporate America, offering a professional playbook for tackling today's most pressing workplace issues. Michelle Gadsden-Williams is an award-winning global diversity expert, activist, philanthropist, and the managing director and North American inclusion and diversity lead at Accenture. She has more than twenty-five years of experience working in the consumer goods, pharmaceutical, financial, and professional services industries. She has held positions of global responsibility for corporations such as Credit Suisse, Novartis, and Merck & Co. She serves on several boards including the Jackie Robinson Foundation, Lupus Research Alliance, and the Women's Leadership Board of the John F. Kennedy School of Government at Harvard University. Gadsden-Williams has a BA in communications with a minor in marketing from Kean College, and an MS in organizational dynamics from the University of Pennsylvania. She lives in New York City with her husband, David Jamal Williams.Carolyn M. Brown is an award-winning journalist, author, and playwright. Her work has appeared in Essence, Pink, Black Enterprise, Forbes Executive Edge, the Source, Hispanic Business, AOL BlackVoices, and elsewhere. She is the founder of the True Colors Project, a social enterprise, and the cofounder and executive director of the My True Colors Festival, a multidisciplinary social justice arts event. She is the author of The Millionaires' Club and Nobody's Business but Your Own and is a 2012 GLAAD Media Award winner for Outstanding Magazine Article.